Water, soybean oil, sugar, salt, vinegar, buttermilk powder, modified corn starch, onion & garlic powder, xanthan gum, natural flavour, phosphoric acid, sorbic acid, polysorbate 60, spice, lemon juice concentrate, propylene glycol alginate, yeast extract, parsley, calcium disodium edta. Add classic buttermilk ranch flavour to your menu items with Hellmann's Classics Ranch Salad Dressing. Made with real, simple ingredients that your guests can trust, this gluten-free ranch dressing contains no high fructose corn syrup or artificial colours or flavours. It clings exceptionally well to leafy greens, helping enhance their flavour. Whether paired with a house salad or served as a tasty dip, this dressing is sure to leave your patrons with a positive impression. Hellmann's® Creamy Ranch is made with real buttermilk and is Gluten-Free. The Hellmann's® brand is recognized throughout the world for unrivaled quality and flavour and its commitment to real, simple ingredients, like real buttermilk. 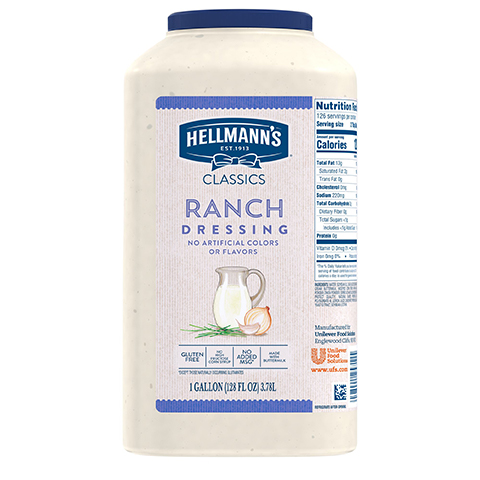 Hellmann's Creamy Ranch dressing is great for green salads, bound salads, on vegetables, as a dip, sandwich sauce and more.